But I’ve never fenced before!! Do I need fencing experience to join the Thundercats Fencing Team??? Absolutely not! We welcome all levels of experience. There are no tryouts. If you have a good attitude, an adventuresome spirit, can follow instructions and are willing to learn, there is a place for you on our team. If I’ve never fenced before, what chance do I have of making the team? The good news is that most of your teammates have never fenced before either. 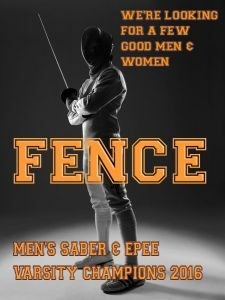 Our team is open to everyone who is interested in learning to fence. That means you will make the team if you try out, and you will probably do pretty well your first year. Pretty cool right? Do I need to have my own equipment in order to fence? No!!! To get started all you need are an athletic shoes, sweat pants (no shorts) and a water bottle. Shirts are optional. Just kidding. Wear a shirt! If you’re just getting started you can use equipment from our armory (yeah, we’ve got an armory) during practices. We provide masks, practice weapons, competition weapons, lames, body cords and use of high tech electronic scoring boxes. But please note, you will need your own gear to fence in tournaments. The total cost for everything you’ll need to be fully equipped is approximately $300 for epee and $400 for sabre. Yeah, it’s kind of pricey, but it’s a lot less than hockey or football equipment – and Christmas is right in the middle of fencing season…..so maybe an early present? If you can’t afford your own gear, talk to one of the coaches. We have a limited amount of loaner gear. In addition, LHS and VHHS have special programs to support athletic participation for families with limited resources. Who do we fight, or fence, or whatever? The Thundercats Fencing Team is a member of the Great Lakes High School Fencing Conference. Where do we practice and when?? We practice in the Libertyville High School cafeteria. Fencers tend to be very involved in academics and extra-curricular activities. As a result we practice three days a week. Practices are held three days a week between mid- October and the first week of February. See the Team Calendar for days and times. Fencers are responsible for getting themselves to and from practice. The school district does not provide bus service. What are those sword thingies or weapons? The weapons in fencing are called epee, foil, and saber. The epee (pronounced “EPP-pay”), the descendant of the gentleman’s or officer’s dueling sword, is about 35” long and weighs about 27 ounces, with a larger guard (to protect the hand from a valid hit) and a semi-stiff blade. Touches or points are scored only with the point of the blade. The entire body is the valid target area. The epee is an electric weapon. The blade is wired with a spring-loaded tip at the end that completes an electrical circuit when the tip is pressed. Because the entire body is a valid target area, the epee fencer’s uniform does not include a lame. The foil is the descendant of the gentleman’s or officer’s dueling sword, is about 35” long and weighs about 27 ounces, with a smaller guard that an eppe and a semi-stiff blade. Touches or points are scored only with the point of the blade. Only the torso and neck of your opponent are valid target areas making foil one of the most challenging weapons to fence. It required a combination of speed, accuracy and agility. The foil is an electric weapon. The blade is wired so when the tip comes in to contact with the opponent’s lame (a conductive vest), it completes an electrical circuit and registers a point. The sabre (pronounced saber) is the modern version of the slashing cavalry sword, and is similar in length as the epee but weighs less than 16 ounces. The major difference is that the sabre is a point-thrusting weapon as well as a slashing weapon (side of the blade). The target area is from the top of the hips (both front and back), to the top of the head, simulating the cavalry rider on a horse. The sabre fencer’s uniform includes a metallic jacket (lame), which covers the target area to register a valid touch on the scoring machine. The mask is different from epee, with a metallic covering since the head is valid target area. What does it cost to join the Thundercats? Because we are a club and not part of the school district’s athletic department, the Thundercats gets no financial support from the School District. As a result, we need to cover all of costs by charging Student Activity Fees and relying on donations from individuals, families and corporate sponsors. For the Thundercats Activity Fees click here.